Earn $80 commissions, boost your service offerings, grow your revenue. Most of us ask for recommendations or read reviews to find everything from a great restaurant to a new car. For years I offered a simple referral commission - if you told someone about me and we ended up doing business together I would send you a check for $50. Recently, I realized that my favorite projects come to me this way so I decided to expand the program. I now offer three partnership levels; Affiliate, Colleague and Team Member. Anyone can sign up as an Affiliate and earn unlimited $80 commissions. When you recommend Pixel Lava to friends you can be confident that they'll get great service, fast turnaround times and very reasonable rates. The Colleague and Team Member levels are for fellow graphic artists, marketers, agencies etc. who want to expand their service offerings without hiring staff. By bringing me in as-needed you get a reliable partner at a great rate. You also get access my Partner Portal with special perks like white label marketing materials and small business resources. As a multimedia designer since 1997 I’ve participated in thousands of team projects from websites to motion graphics. I offer professional, experienced service backed by proactive communication and detailed project management. I’ve worked with new business owners and high powered agencies and to every project I bring a friendly, “can do” attitude along with a supportive, team approach. I operate on a work-for-hire basis, the work we create is owned by you (or your client). I am happy to sign NDAs and I do not steal clients or siphon off work for myself. My client is both you and the end user and my goal is to deliver high quality work that will make you proud and leave your client asking for more. The Partner Program is 100% free for everyone to join and there's no contract to sign or anything. The only goal is to make it easy to recommend me and make it more fun to work together. Upon sign up, you'll get a Referral Card Power Pack by mail with customized cards in an artsy card case and a nifty Pixel Lava sticker. For Colleagues and Team Members I'll follow up with your login info for the Partner Portal. How it works: recommend Pixel Lava to people you know and make $80 for every referral that turns into a client. Who is it for: anyone who wants to participate. Benefits: you get $80 and the satisfaction of connecting people you care about to a reliable resource. Example: you recommend Pixel Lava to a friend who needs a website. If they sign a client agreement I pay you $80. How to get started: recommend me by giving people a referral card or by sharing my contact info by email, social media, carrier pigeon, whatever you like. I ask every new client how they heard about me. How it works: when you have a project that you don’t have the ability or desire to complete, contact me for a free quote. You add my part as a line item in your proposal. I can follow up directly to the client or you for implementation (and bill the client or you, whatever you prefer). Who is it for: graphic artists, marketers, videographers and anyone who needs to be able to add services up to win a special project. Benefits: offer additional services without adding staffing, scale up and down as needed. Priority service over other non-critical requests. Example: you are a graphic artist with a prospect who needs a branding overhaul. You're happy to tackle the design work and print items but don't want to handle the website. How to get started: join my free Partner Program. How it works: when you have a project that you don’t have the in-house time or talents to complete, contact me for a free quote. You interface with your client handling project management and then hand off instructions and feedback to me, essentially selling Pixel Lava services as your own. My project estimate goes to you and you are free to mark it up to industry standard rates. Who is it for: creative studios, PR agencies, teams, developers, companies and anyone who needs to be able to scale up to meet a specific project. Benefits: offer additional services without adding staffing, grow your revenue by marking up services. Priority service over other non-critical requests. Example: you are a PR firm with a prospect who needs an online marketing campaign. You're happy to handle the campaign design, messaging and project management but want to outsource custom content creation like infographics or motion graphics. Colleague and white label Team sales materials). Valuable materials to help your business thrive like “How to effectively guide a website project”, “How to Save Time and Money with Online Meetings” and “Tips for Preventing Project Creep”. 1 free Webinar pass ($15 value). Discounts on Pixel Lava classes, tickets to my upcoming Digital Adventure Camp and other goodies. 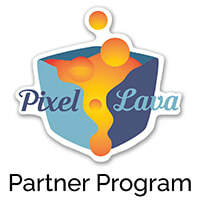 The Free Pixel Lava Partner Program is a great way to boost your business.